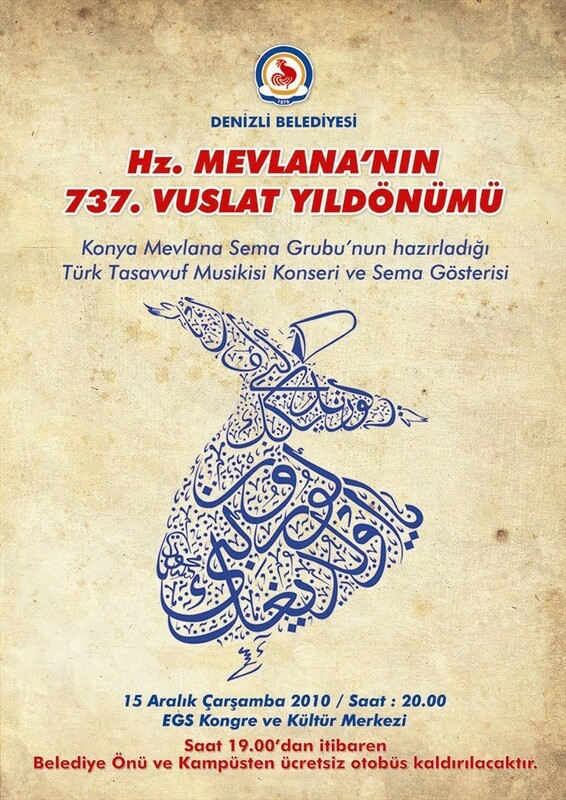 Denizli Municipality within the 737th anniversary of Mevlana, will organize Sufi Music Concert and Dervishes Performance that will be performed by Konya Mevlana Sema Group. Denizli Municipality within the 737th anniversary of Mevlana, will organize Sufi Music Concert and Dervishes Performance that will be performed by Konya Mevlana Sema Group. The Commemoration Ceremony will be held at EGS Congress and Culture Center. The commemoration will start with a solo concert of Turkish Sufi Music followed by a theatrical information presentation about Mevlana and dervishes performance. The Sema Show will be performed after the theatrical presentation. There will be free transportation for the Turkish Sufi Music Concert and Sema Show starting at 20.00. The service vehicles will proceed from Denizli Municipality to the venue at 19.00.